First Line: The first thing Ali saw when she came through the door was the blood. Fourteen-year-old Ali and her boyfriend Kyle have confessed to the bludgeoning deaths of Ali's parents and ten-year-old brother. It's an open-and-shut case. Or is it? When U.S. Senatorial candidate Juliana Thorsson asks Private Investigator Lena Jones to find out if Alison is telling the truth, Lena is in no hurry to help the fiercely ambitious woman until Thorsson divulges the reason why she wants to help a young girl she's never met: she is Ali's biological mother. This fact alone is political dynamite, but that's not the only secret she tells Jones. Since Lena suspects that the teenager's parents may well have had secrets of their own that could have led to the murders, she finally agrees to take the assignment. As she interviews the people who knew the family well, Lena becomes a champion of the two teenagers' innocence, and this stance puts her own life in danger. If you want to read a mystery that gives you a real feel for the Scottsdale and Phoenix metropolitan areas, you can't do better than Betty Webb. But the setting is merely the icing on a cake that is expertly crafted with equal parts character and plot. Lena Jones is my favorite private investigator, and her partner in Desert Investigations, Pima Indian Jimmy Sisiwan, is more than a mere sidekick. Jimmy keeps the business running-- and tries to keep Lena out of trouble-- while she goes off on her dangerous investigations. Lena is strong, smart, and smart-mouthed-- probably because of her childhood in which she was shot in the head, abandoned by her parents, and raised in a series of foster homes by sometimes abusive adults. This tends to put a different spin on life for the survivors, and Lena has always zealously guarded her privacy while fighting for the underdog. 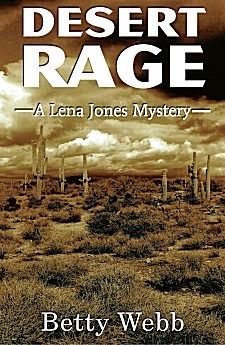 Desert Rage finds Lena searching for more than the identity of the the killer of young Ali's parents. As she tracks down leads and interviews people, she finds herself looking for an answer to the question "What is a mother?" She has plenty of women to compare. Her own mother, her favorite foster mother, Ali's murdered mother as well as her biological one, Kyle's foster mother... the list is a long one, and each woman's behavior gives Lena plenty of food for thought. Although Lena is always the star of the series, in this book Webb gives us alternating points of view: Lena's, Ali's, and Kyle's. It's done sparingly, and it's done well because it gives us true insight into all three characters. Best of all was being able to watch Ali's transformation from a self-centered little girl who appeared to be completely capable of murder to a young woman much more aware of the world around her-- and watching Lena's views of motherhood subtly begin to shift even as she's looking for a killer and in the middle of an arson investigation. Desert Rage is a hard book to put down. It's not necessary to read the books in this series in order, but don't be surprised if you find yourself reading one and then going back to find and read all the rest. This book-- and the entire series-- is Quality. You convinced me! If I can ever get out from under my library stack and TBR stacks and come up for air, I'll check out this book. I've enjoyed the entire series from book one, Kathy. Cathy - I do like the Lena Jones series. It's got a solid sense of place, and I like Lena as a lead character. Having read 1 thru 7 of this series I just downloaded this one and I can hardly wait to start. Then it will be at least a year before the next one. Do you know if there is a new book in her zoo series coming soon? She's working on The Puffin of Death now, Bella. I enjoy those books, too. Each series shows the different sides of Webb's personality.